NAMM 2019 proved once again that the world of effects pedals has rarely been in better health. 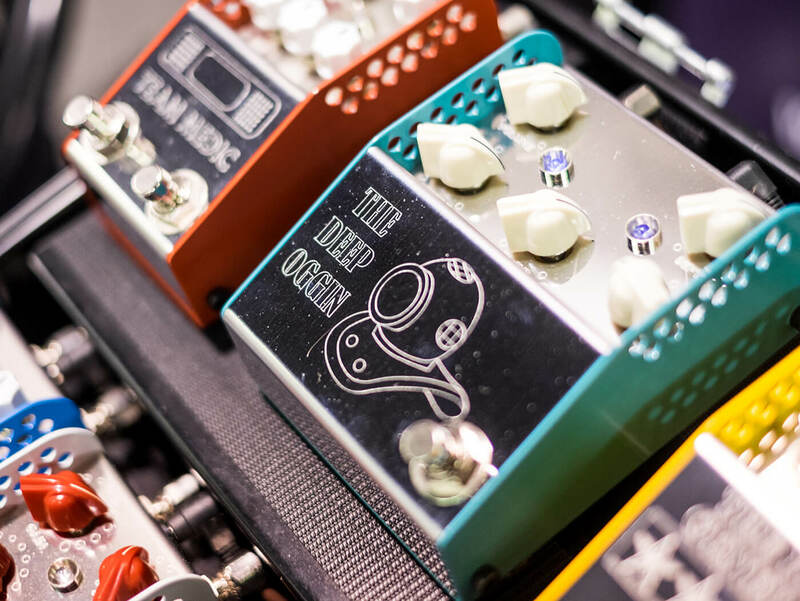 Makers big and small brought to Anaheim scores of interesting, innovative and downright brilliant-sounding new pedals for us to get to grips with. So plentiful and interesting were the new pedals on show at NAMM 2019, the hardest part was picking the cream of the crop. We got there in the end, so here are six of the best new effects units we saw on the show floor at the Anaheim Convention Center. Robert Keeley has long been one of the most innovative and respected minds in the boutique effects industry, and his most exciting new creation for NAMM 2019 was the hugely versatile Fuzz Bender. A three-transistor fuzz pedal, the Fuzz Bender uses both germanium and silicon chips to offer a wide array of classic fuzz tones. But the clever bit is the active EQ that offers 20dB of boost at both 100Hz and at 10kHz. The extra EQ options combine with those transistors to create a plethora of unique and compelling fuzz tones. Strymon has been at the bleeding edge of high-end digital effects wizardry for a decade now. But the Californian company’s latest multi-switch device takes things in a substantially more retro direction than its previous large-format devices. Designed to authentically emulate the wobble, wow and flutter of old-school tape echo units, the Volante offers a fantastically deep and rewarding level of control and tweakability. Combined with the built-in reverb and looper, the Volante is an exciting tool for atmospheric exploration. Beetronics has rapidly developed a reputation for weird and wonderfully creative effects pedals that look as good as they sound, and the new Swarm might be its most crazy pedal yet. Billed as a ‘fuzz harmonizer’, the Swarm mixes a filthy fuzz tone with two different harmonised pitch sounds to create a raucous mashup of searing gain and pitch-shifted, Whammy-style fun. If wild and scuzzy fuzz with 8-bit overtones are your bag, you’ll want this one on your pedalboard. The collaboration between UK effects maker Adrian Thorpe and former Lovetone pedal guru Dan Coggins has been gestating for a long time, but the results finally surfaced at NAMM 2019, and this lush, fully analogue chorus/vibrato pedal is well worth the wait. Voiced to provide a variety of chorus styles from deep and wet through to more subtle and shimmery sounds, the Deep Oggin also adds extra versatility thanks to independent wet and dry outputs. A multi-stage analogue phaser, the Lillian is designed as the ‘sister’ to Walrus’s popular Julia chorus/vibrato. Like its sibling, the quality of its sounds and its ability to shape those tones is hugely impressive. The Lillian, too, features a knob that lets you sweep between dry, phase and vibrato sounds, incorporating as much or as little as you like. The four- or six-stage mode on the other hand, lets you choose between warm and tight phasing of four stages, or strap in for a deeper and more complex six-stage sound. To celebrate the 25th anniversary of Green Day’s seminal album of the same name, the Dookie Drive is designed to emulate the sound of the two heavily modded amps that Billie Joe Armstrong used on the album – one with heavily scooped and high gain, the other more polite and full of midrange. The Dookie Drive lets you blend the sound of these two amps to taste, resulting in remarkably faithful recreations of Armstrong’s guitar tone on the 1994 album. Click here for more NAMM related news and features.